What we can learn from the quarterback. As a die-hard Peyton Manning fan, it is hard not to hate Tom Brady. Despite his own Super Bowl win and a monster turnaround second season in Denver, Manning cannot compare (oh, it hurts so bad to say it) to Tom Brady’s five Super Bowl championship. With the Atlanta Falcons leading by 28–3, it looked like a blowout in the making. 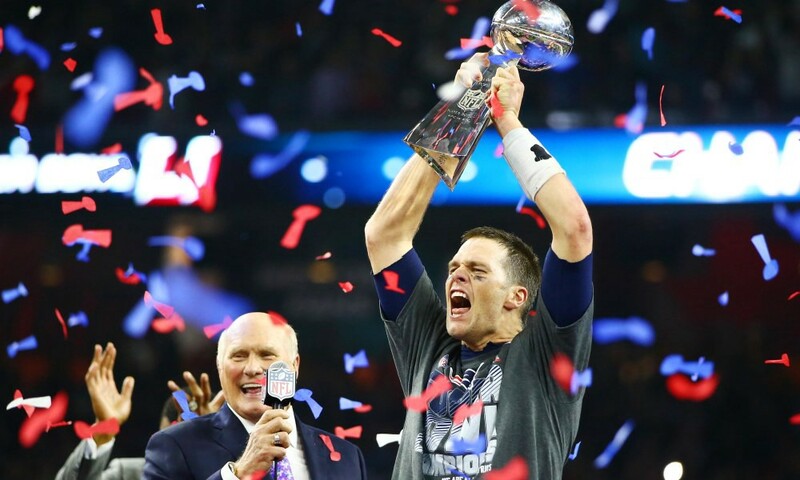 Yet, after half-time this last Super Bowl, Brady led the Patriots to a come-from-behind win, forcing the first overtime in Super Bowl history, and becoming the only quarterback to ever win five Super Bowls. So, what can we mere mortal learn from this? What is the measure of a champion who can stick to his plan no matter what happens and who continues to believe in that vision despite any adversity? 1. Stay focused on the journey. Entrepreneur John Brubaker took heart from the Super Bowl win. He summed up that excruciating overtime victory as just the end of a long journey. “The positive momentum you get by sticking to Plan A and focusing on simply executing the next play is what won the Super Bowl. There was no “Plan B” for the Patriots and there shouldn’t be one for your business either.” Having a plan and staying focused on it led Tom Brady to that win. It proves him to be a champion among men, and not just those who play football. When you run a business, you have to have that same kind determination. There are always challenges that push you down the road toward a Plan B. If you have vetted out a business plan, acquired funding and got to the point where you are running your own business, it is fine to listen and adapt your strategy based on feedback, but be true to your dream. However tough decisions are, you will find that the biggest mistakes were made when you trusted someone else to tell you how you should be running things. 2. Visualization is a powerful tool and helps get the win. Tom Brady said he visualized the day he lost a previous Super Bowl. Then, every day, he would see himself winning this year’s Super Bowl. This technique seems to have been pretty effective. Coupled with Brady’s core principle of “next play, next step, next day,” it is a great carry-over into almost any area of life. There are people who face insurmountable odds, but still continue to work towards their ultimate life’s goals. Stephen Hawking comes to mind. His body deteriorated until he could no longer walk, move or talk, but his mind still held genius that he used to make new discoveries and to inspire generations of scientists. Most of us do not face such insurmountable odds, but it is worthwhile to ask yourself what habits you have built over time that are currently holding you back from being the champion in your vision. 3. If you think you can’t be Tom Brady, you are wrong. So, Tom Brady is a five-time Super Bowl champion. You think you have nothing in common. Yet, we all have the power to emulate what Brady and the Patriots did on Super Bowl Sunday. The entire team, led by the unflappable Brady, kept their composure even when they were behind by 29 points, and the odds seemed insurmountable. Then, the Falcons exhausted themselves playing the long game against a legend. At a critical juncture, Atlanta ran out of gas and their defense collapsed. Of course, the Patriots went in for the kill. They waited, they kept the dream alive and they made history that day. What I have come to realize about Tom Brady is that he is indeed the greatest play of all time, at least of a generation. His mental discipline and capacity to believe in something that he had to make happen himself is truly a superpower we can all tap into. Entrepreneurs, sports players and every day people can adopt this self-discipline to improve all areas of their lives. Even Peyton Manning had kind words for Brady at their last face-off. “All I can say about Tom Brady is that he plays the position the way it’s supposed to be played. As the quarterback, it’s always a great honor and privilege to have competed against [Brady].” Maybe it’s time for me to forget about my hatred and see what I can learn from this guy. If you like the article comment and click the heart!